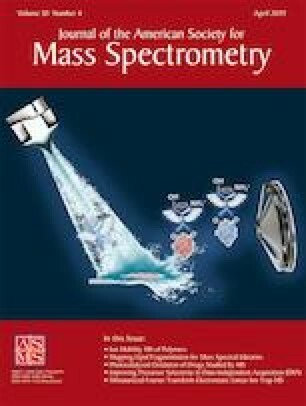 We report ion mobility spectrometry and mass spectrometry studies of the non-enzymatic step-by-step degradation of substance P (subP), an 11-residue neuropeptide, with the sequence Arg1-Pro2-Lys3-Pro4-Gln5-Gln6-Phe7-Phe8-Gly9-Leu10-Met11-NH2, in ethanol. At elevated solution temperatures (55 to 75 °C), several reactions are observed, including a protonation event, i.e., [subP+2H]2+ + H+ → [subP+3H]3+, that appears to be regulated by a configurational change and two sequential bond cleavages (the Pro2-Lys3 peptide bond is cleaved to form the smaller nonapeptide Lys3-Met11-NH2 [subP(3–11)], and subsequently, subP(3–11) is cleaved at the Pro4-Gln5 peptide bond to yield the heptapeptide Gln5-Met11-NH2 [subP(5–11)]). Each of the product peptides [subP(3–11) and subP(5–11)] is accompanied by a complementary diketopiperazine (DKP): cyclo-Arg1-Pro2 (cRP) for the first cleavage, and cyclo-Lys3-Pro4 (cKP) for the second. Insight about the mechanism of degradation is obtained by comparing kinetics calculations of trial model mechanisms with experimental data. The best model of our experimental data indicates that the initial cleavage of subP is regulated by a conformational change, likely a trans→cis isomerization of the Arg1-Pro2 peptide bond. The subP(3–11) product has a long lifetime (t1/2 ~ 30 h at 55 °C) and appears to transition through several structural intermediates prior to dissociation, suggesting that subP(3–11) is initially formed with a Lys3-trans-Pro4 peptide bond configuration and that slow trans→cis isomerization regulates the second bond cleavage event as well. From these data and our model mechanisms, we obtain transition state thermochemistry ranging from ΔH‡ = 41 to 85 kJ mol−1 and ΔS‡ = − 43 to – 157 J mol−1 K−1 for each step in the reaction. This work was supported in part by grants from the National Institute of Health, R01 GM121751-03 (DEC). CRC and DRF were supported by fellowships from the Robert and Marjorie Mann Chair (DEC) and TJE was supported by a fellowship from the Indiana University College of Arts and Sciences. The work at TAMU (DHR) was funded by NSF (CHE-1707675) and NIH (P41GM121751-01A1).